We know more about the surface of the moon that we do about the bottom of the ocean. The sea floor is an alien landscape, with crushing pressure, near-total darkness, and fluids wafting from cracks in the Earth's crust. It's also home to some weird animals that scientists are only just getting to know. Case in point: deep-sea expeditions and drones have revealed a giant group of octopuses and their eggs in a place where they shouldn't be able to survive. "When I first saw the photos, I was like 'No, they shouldn't be there! Not that deep and not that many of them," says Janet Voight, associate curator of zoology at the Field Museum and an author of a new study on the octopuses published in Deep Sea Research Part I. Nearly two miles deep in the ocean, a hundred miles off the Pacific coast of Costa Rica, scientists during two cruises a year apart used subsea vehicles to explore the Dorado Outcrop, a rocky patch of sea floor made of cooled and hardened lava from an underwater volcano. Geochemists explored the outcrop in a tiny submersible vehicle, hoping to collect samples of the warm fluids that emerge from cracks in the rocks; they didn't count on finding dozens of octopuses huddled around the cracks. The octopuses were an unknown species of the genus Muusoctopus—pink, dinner-plate-sized creatures with enormous eyes. Up to a hundred of them seemed to occupy every available rock in a small area. That in itself was strange—Muuscoctopus are normally loners. Stranger still was that nearly all of the octopuses seemed to be mothers, each guarding a clutch of eggs. And this nursery was situated alongside the warm fluid issuing from the cracks in the outcrop. It doesn't make sense for deep-sea octopuses to brood eggs in warm water like this: it's suicide. 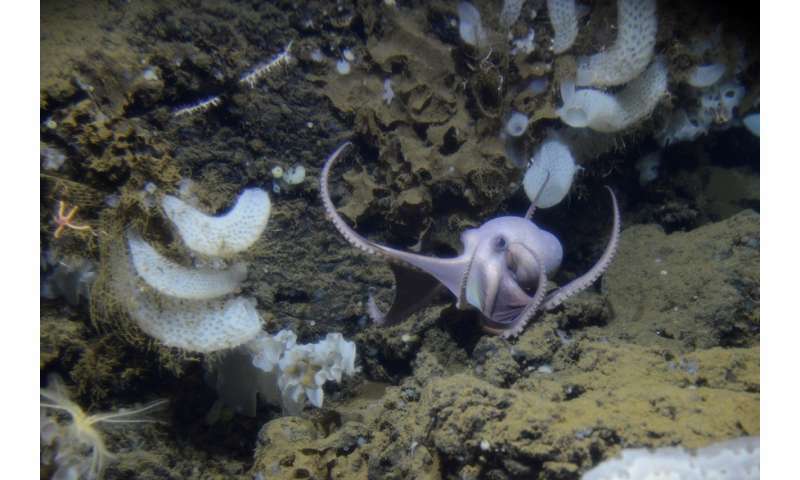 Deep sea octopus live in cold, nearly invariant temperatures. Exposure to higher temperatures jump-starts their metabolism, making them need more oxygen than the warm water can provide. 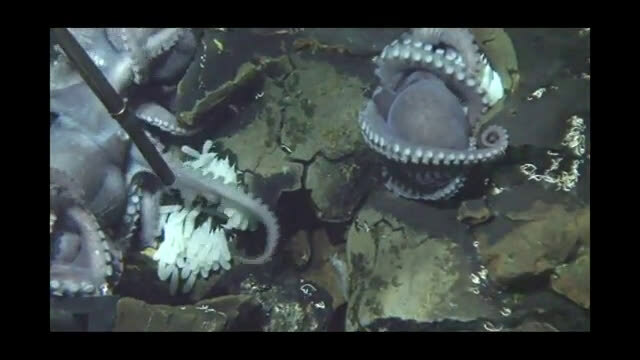 The octopuses that the scientists observed (both in-person and via hours of video footage from an ROV) showed evidence of severe stress, and they could only guess that the 186 eggs that were attached to the rocks leaking warm, low oxygen fluid had it worse. None had any sign of a developing embryo. All in all, not a great place to start an octopus family. However, the sheer number of what the scientist think are doomed octopuses and their eggs suggest that there's a better, healthier habitat nearby. The team suspects there must be more octopuses living inside crevices in the rocks, where the water is cool and rich in oxygen. The crevices could be such a good environment for egg-brooding that the booming population has to spill over into the dangerously warm region outside, like a gentrifying neighborhood expanding into a rougher part of town. "Octopus females only produce one clutch of eggs in their lives. In order for this huge population to be sustained, there must be even more octopuses to replace the dying mothers and eggs that we can see," says Voight. "My coauthors, Geoff Wheat and Anne Hartwell, know about basalt and how an outcrop like this is made. Odds are it has hollow areas where other females nurture their eggs to hatching. They are analogous to the boomers who have all the good jobs, while the millennials wait, seeking just one little piece of the cool rock." Voight notes that there's evidence for the unseen population: the scientists observed octopus arms emerging once in a while from cracks in the rock. The study doesn't just shed light upon deep-sea biology; it also illustrates the collaborative nature of science. "This project was a cohesive dynamic of three scientists from different research backgrounds coming together to investigate a fascinating observation," says Hartwell, the paper's lead author and an oceanographer affiliated with the University of Akron and the University of Alaska Fairbanks. "The focus of [our] expeditions to Dorado Outcrop was to study a cool hydrothermal system. In doing so, we discovered this fascinating congregation of brooding octopuses," says Wheat, a geochemist at the University of Alaska Fairbanks. "To maximize the scientific return of the expeditions, we shared the video with deep-sea biologists, whose research led to this publication. This is only the third hydrothermal system of its type that has been sampled, yet millions of similar environments exist in the deep sea. What other remarkable discoveries are waiting for us?" "These surprising observations show us how a deep-sea animal reproduces," says Barbara Ransom, a program director in the National Science Foundation's Division of Ocean Sciences, which funded the research. "The findings were serendipitous. The researchers saw something unusual and stopped to find out what was happening. Unexpected discoveries like this one can dramatically change our understanding of how the oceans work." "To my knowledge there had been no reports of octopuses at this or comparable depths off between southern California and Peru. 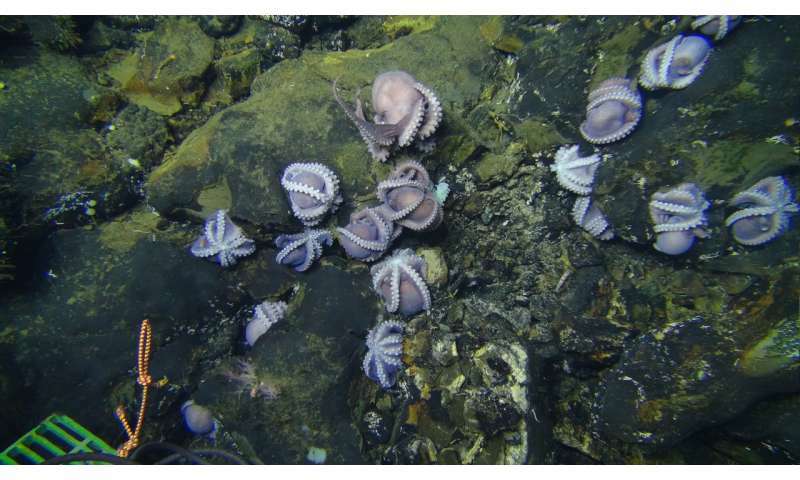 Never would I have anticipated such a dense cluster of these animals at 3000 meters depth, and we argue that the numbers of octopuses we see are simply the surplus population," says Voight. "What else is down there that we can't even imagine? I want to find out." "We know more about the surface of the moon that we do about the bottom of the ocean"
I'm afraid that old cliche is no longer valid. @James, actually you're incorrect. We can see the surface of the Moon with telescopes. We can't see the bottom of the oceans that way, we have to go or send something there, and we haven't done much of that. Just because it's a cliché doesn't mean it's not true; in fact, it became a cliché because it *is* true. This kind of fake logic eats its own head. Yes, the surface of the moon is mapped to a resolution of a few meters per pixel, but so is a large percentage of the ocean floor. We have actually explored an area of the moon smaller than Manhattan Island, all of it only on one side of the moon, and all of it within a few degrees of the equator. I have trouble believing that the statistics for deep ocean exploration are even more dismal. The sea floor is a lot bigger, and I seriously doubt we have resolutions of a few meters per measuring unit with sonar. I'd need to see and investigate some evidence to the contrary. I'll entertain it if you got it. I'll also point out that it's quite common to discover new species, and new details of species behavior and characteristics, when making deep ocean dives. We seem to see articles here on this pretty regularly. The shrimp like fish have over the millions of years have evolved to clean the octopus eggs, the baby octopus when they grow up, go back to the same brooding site as their parents as they have been doing for millions of years, mothers often sacrifice themselves for their offspring, but in this case the mothers just swim away when the octopus hatch.